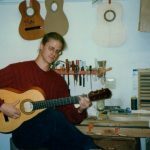 I made Calvin a cedar top flamenco guitar in the 90s. Eventually, I replaced that cedar top with spruce. You can find a bit Calvin’s bio by clicking here. Below is Calvin Playing the spruce top. You can see the cedar top hanging on the wall. It was Calvin who gave me the name “El Caracol”. I have tried to live up to that moniker ever since.